In 1999, after about eight publishers passed on “The Dirty Cowboy,” I sent the manuscript to Charlesbridge Publishing, and a few months later found a kind, personal rejection from Harold Underdown. His letter mentioned a few things he liked, and a few things he didn’t like, and then he said, “pacing is all-important in tall tales.” Tall tale? 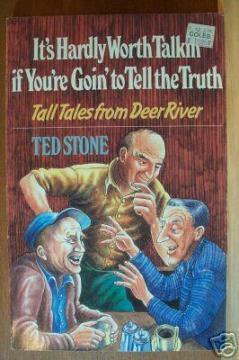 Now here’s an embarrassing admission: I never thought of my story as a tall tale. Exaggerated? Embellished? Fanciful? Well, yeah — that’s the way we told stories in my family. But a tall tale? Like Paul Bunyan and Babe the Blue Ox? And then it seemed so obvious. I must’ve groaned then. Of course “The Dirty Cowboy” was a tall tale! So I decided to take the rejection as a challenge. – excerpted from this article. Tall tales are a classic form in Australia. If you travel in the outback, you’re likely to come across an old man who is particularly good at telling yarns. If he’s really good (and it’s often a ‘he’), he’ll have you believing him right up until the end, when he’s ‘gotcha’. For an example of such a tale, listen to a master. This bloke (‘Bongo’) rang into an Australian radio station cracking on his story is true. If it’s true, I’ll eat every single one of my hats. Go to episode 404 of Mysterious Universe and, unless you want to hear all about sleep paralysis and trolls sitting on chests (which is also fascinating), you can skip straight to Bongo’s yarn at 51:25. Strange things happen in the Outback. A type of tall tale is the ‘shaggy-dog story’. In its original sense, a shaggy dog story is an extremely long-winded anecdote characterised by extensive narration of typically irrelevant incidents and terminated by an anticlimax or a pointless punchline. They are designed to entertain. They’re not famous for being elegant or realistic or psychologically insightful. Shaggy Dog stories are also known in some Internet circles as ‘feghoots’. A feghoot is described as a short-short story (300 words on average, although 500-word examples exist), ending in a pun or a punchline that is pretty obviously the only reason for the story’s existence. The telling detail in a Feghoot is the groan emitted by the reader/listener when he hits the punchline. In essence, the feghoot is an Overly Pre-Prepared Gag in short story form. The Feghoot is named for the character Ferdinand Feghoot, created by Science Fiction author Reginald Bretnor using the pen name Grendel Briarton. Bretnor chronicled Feghoot’s adventures in the multi-year series “Through Time and Space with Ferdinand Feghoot!”, in which each instalment was a short-short that ended in a horrific pun. When it’s told by an oral storyteller it tends to be called a shaggy dog story. When a science fiction writer does it, like Isaac Asimov or Arthur C. Clarke, it tends to be called a Feghoot. Mark Twain was a teller of tall tales. Paul Bunyan told jokes about rural yokels and political heroics. Gulliver’s Travels almost fits into the category. The potboiler Western is a type of tall tale, full of braggadocio. The tall tale seems to be a particularly masculine form. They are competitive — who can tell the best one? Tellers participate in ‘capping’ contests in which someone tells a tall tale, and others join in to make it even better — a kind of narrative exchange. The aim is to make the tales increasingly outlandish. Who can get away with the greatest exaggeration? The ‘getting away with’ is as important as the exaggeration itself. The Australian tall tale serves to reinforce ‘mateship’ (to reaffirm the solidarity of a group). In a sense, tall tales are satiric. What do they satirise? Often themselves, or the art of serious storytelling. They make fun of people who would believe everything they hear. Tall tales are not meant to be believed. But when it comes to tall tales, it’s not about the story content but all in the story’s telling. The sound of the voice is key. The storyteller speaks in the local vernacular (of men, particularly white men). Names are familiar to the audience. Tall tales require not a reader but a hearer. In this way, a tall tale is a type of exchange. The speaker’s face is also important. He might wink or show mock surprise or make an expression to convey that what he is saying is not true. The main requirement of a tall tale is exaggeration: There are unbelievable creatures, huge fish, large distances, huge volumes. But hyperbole alone does not mean ‘tallness’. In a tall tale, the listener must both accept and refute. The listener has to know enough of the environment in which the tale is told to realise this can’t be true. The line between fact and fiction is hazy, and the humour derives from pushing that boundary. Which parts of this story are true, and which aren’t? Tall tales have their origins in folk tales. The tall tale is a Eurasian form of story, and has its roots in The Canterbury Tales and similar. In Australia, the celebration of the liar is a recurrent motif. Someone who starts rumours is called a ‘Tom Collins’. Tom Collins was the pseudonym of Joseph Furphy. A ‘furphy’ is a lie or a made up story. See also illywhacker. But it’s worth making a distinction between ‘fictive’ and ‘fictitious’. In a fictive tale the listener knows what he’s hearing is not true. Not so in a fictitious tale, in which he’s genuinely duped. What’s the point of a tale which is obviously a lie? Lies should not be read as simply an intent to deceive but as a strategy designed to invite closer attention. In this way, a tall tale can subvert. A shaggy dog tale is similar to a tall tale. The aim is to keep the listener interested, then end abruptly with no real climax. The listener will be disappointed and the teller will take delight in having strung them along. Dr Seuss loved Tall Tales. See And To Think I Saw It On Mulberry Street. Tall tales are very fun to write and free the imagination to perhaps go on to write something a little less fanciful later. I once had a Year 8 relief teacher called Mrs Bray [insert unfortunate donkey pun], who actually did a much better job of teaching than my regular teacher, who really wanted to be a young adult novelist (and later achieved publication). Despite the fact Mrs Bray got lots of grief for not being ‘our proper teacher’ I secretly regretted that she didn’t stay on full-time. TALL STORY by me, aged 10 or 11. I began on a Tuesday, because it wasn’t raining. Since I hadn’t enough money to go anywhere I thought I’d dig a hole to China. It took me about half an hour and when I got there, a whole lot of Chinese people ran up to me and attacked me with chopsticks. [This little bit of xenophobia earned me two ticks in the margin.] I flipped over them and ran to the Space Centre where I jumped in a rocket and flew to the moon. The brakes didn’t work and I was about to crash. It didn’t matter because the cheese was soft. I ate some, then flew back to earth. I landed in a desert and to get back home I had to cross water. I got some helium which managed to survive the crash and inflated a camels [sic] humps. I held on to its legs and told it to float to New Zealand or else I’d chew its toenails off. He told me he had no control over which way the wind blew and we ended up on the clouds. They were bouncy, like a trampoline. I slid down the north pole and landed on top of an igloo. The Eskimos [see above] were nice people [redeemed] who invited me in for tea. We had some Maggi soup. [‘soup’ made out of powder and boiling water, for the unlucky uninitiated] Then I swum [sic] to New Zealand. By then it was dark and I couldn’t see where I was going, but finally got home where Mum sent me to bed. But a monster peeked in the window and I hit him over the head with my bed. We had monster sandwiches for weeks afterward. It’s rather disturbing how well I managed to fill that brief.